Plea for the establishment of the International Council of States for Development Planning and activate cooperation between States and business corporations worldwide. Multy Global Offshore Cooperation, Agreement between the corporate business for service companies and start-ups, service management corporations from around the world and the right to organize markets and developing activities for building the civilization of networks. Please support start and mobilization, with profits for supporting. The ability of joint trade agreements by bilateral, multilateral or state format, the just and liberal agreements with warranty. 100% profit return on your investments and your right to control the function of economic cycles as a guarantee of the success of the business. IDs mran rule and priority is Justice and Justice Agreements for all agree sides. Development cooperation is open to full International market, developing a range of options is a range of free competition, or through consortia contracts. Rental agreement for a printer of banknotes and technologies for the management of the register and coins. Opening the possibility to use IDs coins on the territory of your government, or an agreement on exchange. Support for setting up offshore corporations and businesses in the territory of your jurisdiction, for the stabilization of markets and the development of civilizations. 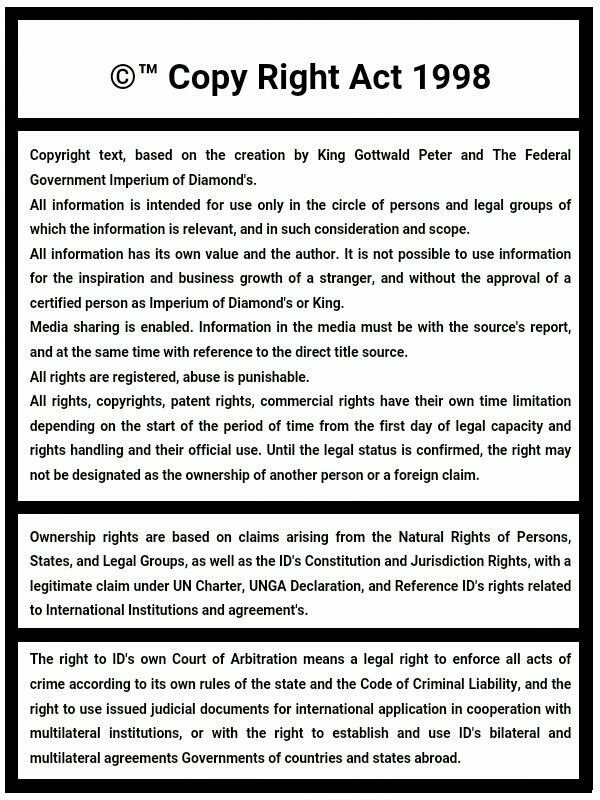 The right to open offshore or legal form of your corporations in the territory of Diamond Oasis, and Imperium of Diamonds. Investing in the interests of open water, 100% back. Investments in open interest farm, a 100% return. Investments in open interest in the metallurgical industry, 100% back. Investments opened in the interests of the chemical industry, 100% back. Investments open in the interest of the construction industry, 100% back. Investments in open interest in the electronic industry, 100% back. Investment for Consumer markets under the Agreement on profits. Investing another factor, according to joint agreements. Right Realtors throughout the world for investing in land and development of real estate projects. Only Industrial soil zone, and change for business corporations with plan for development. Support Research on land and raw material resources, start mining by the lease agreement mimes. Co-investment to open platforms for mining in the oceans. The agreement on the opening of the basic operation of small aircraft landing lines and landing ramp parcel containers. An agreement on cooperation for the development of the airport. Plan for Development hover-craft ports and industrial zones for the production of super high-speed version of the hover-craft transports. Ability to establish a joint military base for international missions continental security and strategic cooperation. Cooperation for the establishment of the Astronomical Observatories. Cooperation for development of meteorological stations, Block central, south, east, west. Plea for support registry in geographic maps, especially the ID's Diamond Oasis, north eastern Africa. Open right for development cooperation in the Car Industries and building of the Car Factories, ID's state and International Infrastructure development.